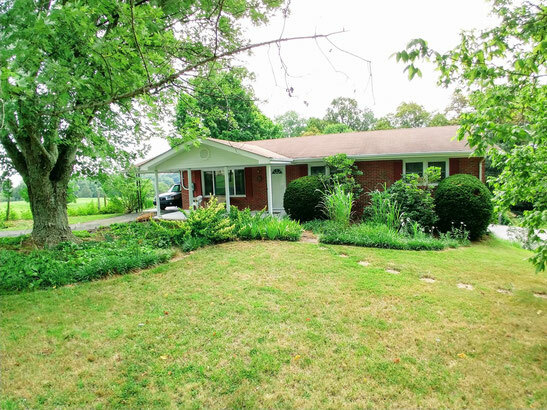 Solid brick ranch in a very convenient location, offering 4 bedrooms and 2 ½ baths on almost a half acre lot. The spacious living room has hardwood floors and lots of natural light. The large kitchen has a bar and eat-in area, with a door leading to a one-car carport. The formal dining room offers lots of space, a large closet which could be used as a pantry, and patio doors which open up to an inviting deck overlooking a private, fenced back yard and garden area. This lovely home has the original, beautiful hardwoods in the living room, hallway and upstairs bedrooms; replacement windows; and, a newer heat pump. The downstairs has a den, two rooms for storage or office space, a full bath, and a fourth bedroom with outside access. There is also a one-car drive-under garage in the walkout basement area. This home has 2592 SF and is affordably priced at $64/SF. All the conveniences of city life, but with a country feel! This one won’t last long!